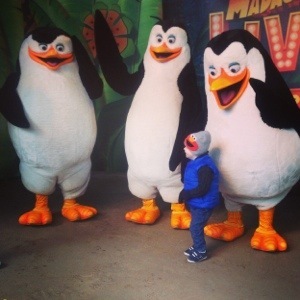 For my *cough* 23rd birthday, the OH lovingly took us all to Chessington World of Adventures. 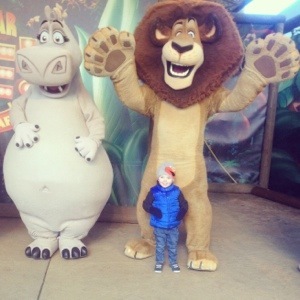 The package he booked was the African Adventure, which included the zoo and a stay at the on site hotel. Being out of season the majority of the park and rides were closed but that didn’t stop us having enormous amounts of fun. 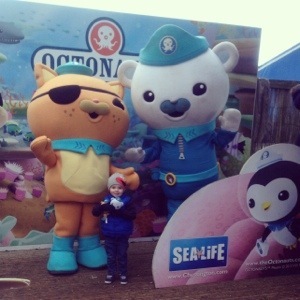 What sold the toddler though was a chance to meet his hero’s, Kwazii & Captain Barnacles from Octonauts. And to wander around the aquarium too. 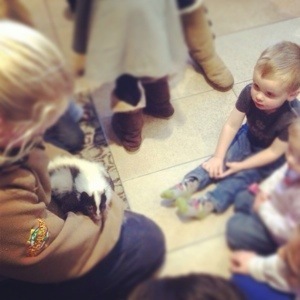 The variety of animals at the zoo is perfect. The enclosures are great especially the gorilla and lion area. And we are quite the zoo connoisseurs , so this is such a compliment! We got a chance to see everything on the Saturday (the park tickets were just for 1 day) except for the Aquarium, but this was only due to the terrible weather and not something the park could change. We did enquire at the hotel reception the following morning and the amazing staff allowed us to return so Dex could look at the fish he’d been banging on about all night! Excellent customer service. The only downside about the park being part open was the lack of toilets that were open. 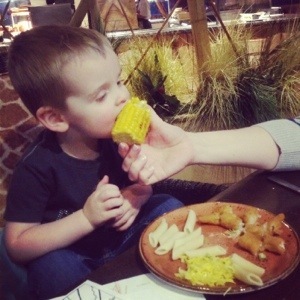 Nope ideal with a toddler in tow that is still known to piddle down his trouser leg. That said there was around 1001 happy members of staff around to point you in the right direction. We wondered if they are all still this happy towards the end of season. The hotel was amazing. It’s really not your standard Holiday Inn as it backs onto the Wanyama Village & Reserve. I don’t think they let the giraffes out whilst we were there because of the strong wind but the waiter did tell us that they are a common sight to see whilst eating your breakfast. We did manage to see some Zebra, Sitatungas and Ostrich whilst ordering our early dinner which was very impressive. 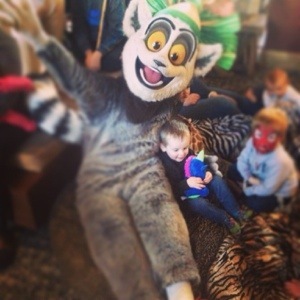 The hotel provides activities for children, even for toddlers. Dex was ecstatic about meeting Julian & Alex from Madagascar, touching a real snake, skunk and cockroach, and lounging around watching films in the mahoosive pile of bean bags they have in reception. 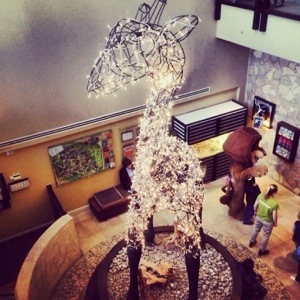 The reception decor definitely has the wow factor, we were all impressed by the giraffe light feature and the enormous giraffe outside the restaurant. The food was great too. Dinner was a bit pricey but you are, of course, paying for the experience. We really liked the bedroom. 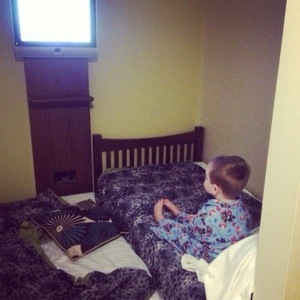 Dex had his own little area; with a TV and twin beds, both beds passed the bounce test! I think we’d definitely visit again. The park rides are of course too big for Dex so another out of season trip would be perfect, maybe with less gale force wind though.